Nowadays most of the computer software applications are Web Application and its usage is growing day by day. Due to this reason, many companies are providing Web Application Services. If we observe clearly, each city of India has more than one Web Application Service provider. By this we can understand the importance of Web Applications in our daily life. So, we want to inform that Digital Aroma is also providing Web Application Development Services in Vijayawada. Read the complete article to know about Web Application Development. What are Web Application Services? Why Web Application Development Services? How does Web App Development Work? Above are some of the contents we are providing in this blog. Candidates those want to know complete details about Web Application Services are advised to go through the entire article. Or else you can also read the specific content of your choice. Readers those are need of Web Application Services are suggested to go through introduction part thoroughly. Web Services also called as Application Services are the services are which is a combination of programming & data and also includes Human Resources made available from a business’s Web server for Web users or other Web-connected programs. Web Service Provider also known as Web Application Provider. Web Services ranges from major services such as storage management to limited services like furnishing of a stock quote. Web Application Services allow other applications to talk to each other and share data and services among themselves. Other applications can also use the web services. For example, a VB or .NET application can talk to Java web services and vice versa. Web services are used to make the application platform and technology independent. These web applications play major role in Ecommerce sites like Amazon and other shopping sites. 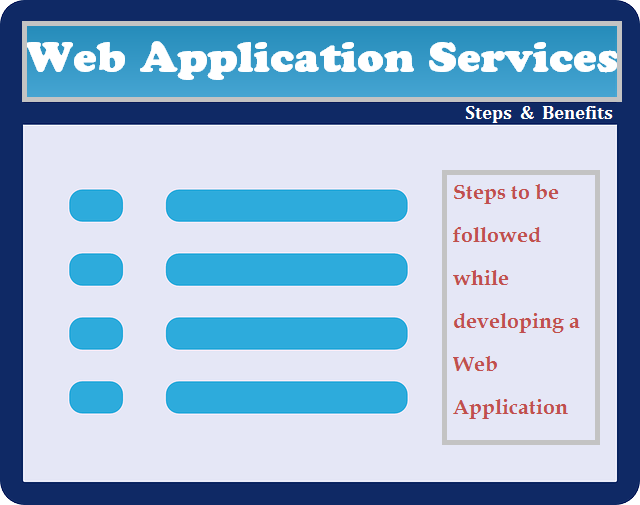 Follow the below steps to know how Web Application Works. First of all web client request through HTTP to web server. Web server message send to static data store through static data request. Static data store response to web server and forward to application server through servlet request which contain web container and all other services. Finally, web server response to web client or user through HTTP Response. We are providing a few steps that every developer should follow while developing Web Applications. With the help of these steps one can develop a hassle free web applications which satisfy their customers and web app users. The first and foremost step is to establish the goals and purpose of your web application. This step is considered to be very essential because it provides the proper direction for the entire project. Second step is to identify the target audience for your web application. You should prepare a proper analytics report by consider few elements like ‘Type of Audience’, ‘Web Access Capabilities of Audience’, ‘Security Level’ etc. A functional specification document is one of the significant documents in any web application project. This document allows to eliminate any kind of confusions occur in future. This document lists all technical specifications and functionalities of a web application which is to be developed. It is very difficult to detail each type of user behaviour in the big projects. In such cases we can prepare Feature Summary Document. In this stage various things such as platform, technology, environment, structure and framework are defined. Along with that, timeline within which the web application has to be developed is decided. This stage is assumed to be one of the critical stages in Web Application Development. It starts with the creation of a visual guide or a simple sketch of a UI. The design will be implemented once after the interface and interaction models are approved. QA Testing and bug fixing is the final step in web application development. A web application must be put through the paces, and all suitable testing techniques must be employed, including load testing, stress testing, performance testing, usability testing etc. Every Web Application Development Company will follow the above 8 steps while developing web apps. Hope these steps will be helpful for all web application developers. To know detailed information about above mentioned steps, check out the below provided link. Digital Aroma has recognized the increased usage of Web Applications in day to day life. That’s why we have started providing Web Application Services in Vijayawada. From past one year, Digital Aroma has provided different kinds of Web Application Services for their customers according to their business. Our team will execute all the Web Application projects with special interest as they know the importance of web services. We have well experienced team in Digital Aroma who can educate our customers and then suggest which kind of service will suitable for their business. Unlike all other web application services in Vijayawada, Digital Aroma always concentrates on customer satisfaction and handover the projects in time to their clients. Following are the top 6 Benefits of Web App Development Services. All the readers are advised to know full details about the below benefits and implement Web Application Development Services. In general, every Web Application Development Company will develop web apps in such a way that their customers should get the above benefits. Web Applications is playing the prominent role in our daily life. By this we can understand the importance of Web Application Services. Our intension is to educate the readers about Web Applications through this blog and make them implement suitable web application development Services for their business. Candidates those who want Web Application Development Services can consult Digital Aroma. Our team will review your business and suggest the suitable web application with free consultation. Still if you have doubts about Web Application Services in Vijayawada can post your doubts in below comment box.